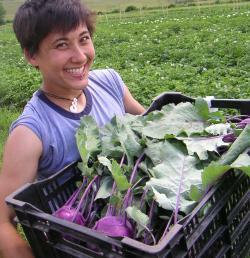 Stone Soup Farm is a 20-acre vegetable and egg farm in Hadley, MA that uses environmentally responsible practices. We offer a 20-week Summer Share that begins the first week of June. This is a typical New England farm share of diverse, seasonal vegetables and includes access to a pick-your-own plot that has various fresh herbs, cutting flowers, cherry tomatoes, green beans, peas and more. Members may also add on an egg share (free-range and fed organic grain) or a fruit share with fruit sourced from other local farms. 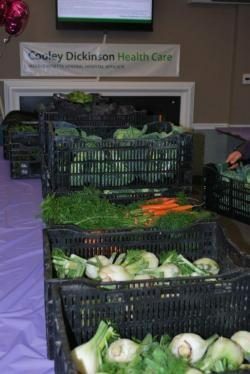 Pick-up will be Thursdays from 3:30-6:00 in Northampton outside Cooley Dickinson Hospital and on Saturdays from 9:00-12:00 at the farm in Hadley (see CSA sidebar for details). Our winter share features 12 bi-weekly distributions from November-April. 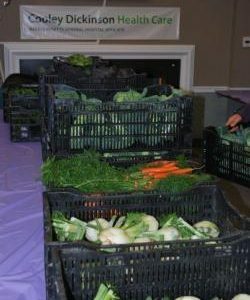 Shares include a mix of storage crops – beets, carrots, onions, garlic, sweet potatoes, potatoes, cabbage, etc – as well as greens from the high tunnels. Each distribution also features a local food producer, and these “treats”? include local honey, jams, yogurt, pickles, granola, mushrooms, and other delicious goodies! The winter share is available for a cost of $350 and is available for pick-up at multiple sites. We also offer wholesale to local restaurants and grocery stores. We offer a 20-week Summer Share that begins the first week of June. This is a typical New England farm share of diverse, seasonal vegetables and includes access to a pick-your-own plot that has various fresh herbs, cutting flowers, cherry tomatoes, green beans, peas and more. Members may also add on an egg share (free-range and fed organic grain) or a fruit share with fruit sourced from other local farms. Our winter share features 12 bi-weekly distributions from November-April. Shares include a mix of storage crops – beets, carrots, onions, garlic, sweet potatoes, potatoes, cabbage, etc – as well as greens from the high tunnels. Each distribution also features a local food producer, and these “treats”? include local honey, jams, yogurt, pickles, granola, mushrooms, and other delicious goodies!